Yack Arena – Sidock Group Inc.
Project Size: 35,000 sq. ft. Original new ice arena with a single ice sheet, locker rooms, stands, concession areas, and meeting rooms. 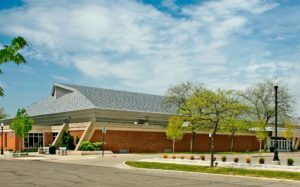 Subsequent projects at the arena included renovation of all interior spaces, warming room addition, multi use room, recreation department offices, storage, new entrance lobby/ticket area, and renovation of 4 locker rooms and two additional dedicated team rooms.